"Discover Little-Known Training Strategies to Quickly Teach Your Dog to Become Well-Behaved and Obedient... Without Spending Hours and Hours Training"
I don't have to tell you how important a well-behaved dog is. If your dog jumps, steals, begs or doesn't listen to you, you know how frustrating and discouraging it is. You know what I'm talking about; when a friend comes over and your dog jumps all over him. You get angry, you make excuses and you just wish your dog would listen to you and behave. If that's the case, why isn't your dog listening to you? Why doesn't your dog listen to your commands? Why doesn't your dog stop jumping when you ask? Why do you put up with the annoying behaviors that your dog does day in and day out? No doubt that you have tried to train your dog. You have probably spent time and money trying to get your dog to stop doing certain problem behaviors. If that's the case (and I believe it is), why aren't you getting the results that you want? 1. You tried different training methods but didn't get the results you were looking for. 2. You're frustrated and don't know who to listen to. If you fall into the first category, you're not alone. You and a lot of other dog owners get ill when they think of the time and money they have spent trying to fix their dog's behavior problems. If you're like a lot of dog owners, you simply don't know who to listen to. Can't stand it when your dog begs at the table? Wish that your dog would just listen to you when you say, "go lie down." Tired of apologizing for your dog's bad behavior? Irritated because you have no control over your dog's behavior? "...Teach Your Dog to Stop Jumping, Stealing, Begging, Barking and to Respond to Your Commands Without Spending Hours and Hours Training Your Dog"
Instead of relying on friends, family or "other experts" to show you how to get your dog to behave, the Good K9 Manners program will show you how to get your dog to behave without you having to try and figure it out on your own. Isn't that what a good behavior training program is supposed to do? See A List Of Dog Owners Who Have Already Benefited From Training With Eric Letendre. "...There Are Three Types of Training Programs, (1) Ones That Don't Work, (2) Ones That Bring Okay Results, and (3) Those That Have the Ability to Transform Your Dog's Behavior. Here's How to Tell the Difference..."
1. It's easy. Let's face it, if it requires a lot of hard work, who wants to do it? You want your dog to behave but you don't want to spend a lot of time and money to train your dog. The best training programs don't rely on expensive training equipment and detailed instructions. 2. You get results fast. When you watch the videos, you'll see me working and getting results within minutes, sometimes seconds. In the begging video, you'll see how I get instant results and how I teach a dog to turn her head when I offer her a piece of food, no shouting, no harsh corrections. These are simple and easy training techniques that a five year old child could do. 3. The training program has long-term results. Dogs that love to steal food off the table learn to not do it when you are there. As soon as you leave the room, your dog knows that the coast is clear and jumps up on the table. You'll discover a unique method that will stop your dog from stealing forever. "Understand and Train Your Dog to Behave On Command!" The reason you'll be able to do this is because the Good K9 Mannersprogram is based on an innovative training and behavior system proven to work. A system is a process which produces results that are, (1) predictable, and (2) consistent. M – Manage. Learn how to effectively manage your dog's behavior. And that's exactly what the Good K9 Manners program will show you. It will save you time, money and a lot of headaches. "The Good K9 Manners Program Contains the Most Unique, Unusual and EffectiveTraining System Ever Assembled..."
"...with Step by Step Instructional Videos that Explain In Detail How to Deal with the Most Common Behavior Problems so You Can See and Hear How They Work Live"
"Here's What You'll Discover in the Good K9 Manners Program..."
On the Good K9 Manners program videos, you'll see actual demonstrations of the training methods in action. You'll also get a step-by-step plan to follow to ensure maximum training results. It's as if you had me in the house with you helping you train your dog. "Which One of these Behavior Problems Would You Like to Solve In the Next Few Days?" "Here Are Three Reasons Why You Will Not Find a Good K9 Manners Program Like This Anywhere for Any Price"
Reason #1- Most dog training programs teach you how to use a type of training equipment; choke, prong, or electronic collars to get results. The Good K9 Manners program is based on a proven system which does not rely on expensive equipment or difficult methods. Reason # 2 – Instead of just telling you how a training system works – the Good K9 Manners program shows you actual videos that take you step by step through the training methods with your dog and how and why they work. Reason # 3 – You won't find a more detailed collection of different, unique, and effective training techniques anywhere, for any price. It has taken years of hands on training to boil down and compile all the techniques that you get with this program. There isn't any other program like it. "Here's Exactly What You Are Going to Receive When You Order the Good K9 Manners Program"
The Good K9 Manners program includes 6 online video lessons. Each video lesson contains detailed explanations of different techniques to deal with common behavior problems – jumping, stealing, begging, etc. When you play each video, all you need to do is sit back, listen and watch as you learn how to solve each problem. You'll also see me working with dogs that have the exact same behavior problems in real life situations. There is no theory here, it is all hands-on, actual training going on in these videos. I know you're all excited to start training. You watched the videos and are ready to go…but you don't know where to start. This is where the Good K9 Manners training guide comes in. The training guide will help you along every step of the way. You'll be able to identify your biggest problems and how to tackle them. This is a unique guide that I normally only use when I am working privately with a client. 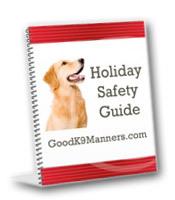 In the Good K9 Manners program I've included my Holiday Safety Guide. The guide shares the tips that I have been recommending to my clients for years. Around the holidays, there are many different ways for your dog to get sick or injured. This handy little guide will point out what you need to look out for and the steps to take to make sure everyone has a safe and happy holiday season. Do you know the biggest complaint among dog owners? It's simple: SHEDDING! I wrote this report five years ago and it has become very popular. Groomers all over the country use this very same report in their businesses. The report shows you eight simple steps that you can follow to reduce loose fur all over your house. "What Would A Well-Behaved Dog Be Worth To You?" What if your dog stopped stealing food off the counter and you didn't have to worry about your dog stealing the T-bone steak off the grill? What if your dog stopped chewing and destroying your furniture? Would that save you $20, $30, $50, maybe over $100? If your dog stops chewing on the furniture and you don't lose the steak off the grill…this program will have completely paid for itself. In other words…it will be free! 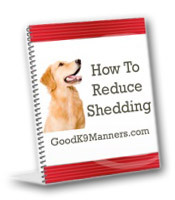 To order the Good K9 Manners program, simply click on the link below and get instant access. 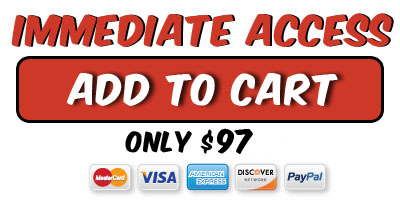 Once the payment process has been completed successfully, you will be taken to the registration page where you'll set up your username and password. Once that is done, you'll be taken immediately into the Good K9 Manners program, member's only website. And of course, you can always log in at any time by visiting this site and clicking on the "Members Log In Here" link in the upper left hand margin. After 20+ years of helping train thousands of dogs, I can confidently say with 100% assurance that the Good K9 Manners program is the most powerful training program you will ever invest in… bar none.